Course Description This course provides an introduction to Advertising. Prerequisites: none. 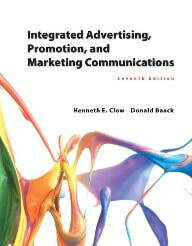 This course provides students an opportunity to gain an understanding of advertising and other mass communications marketing practices: common business activities and terminology, perspectives applied when taking the optimal approach to decisions, plus descriptions and rationales of common practices (which are often far from optimal). The class itself places emphasis on developing students' abilities to express their analysis and recommendations in class discussion, essay exams and written assignments. The greatest difficulty for students in this class is shifting perceptual focus. You can no longer think as if you are part of the audience (as you do when you watch television commercials or read magazines), but instead, as if you are the creators of communications strategies. And you must put aside your personal tastes. Since not all audience members (if any) are people like you, advertising strategy and tactics must be assessed in terms of what a target audience might perceive, not in terms of what appeals to you. This is being realistic: in business, people preparing advertising, publicity and sales promotion strategy and tactics are seldom members of the target audience and strategy desirability must be judged in terms of what a target audience might like, dislike or understand. And this also means we will be covering some topic areas and using examples that you might find offensive, such as sexual appeals, or media vehicles whose audiences are people whose lifestyles or values are not the same as yours. Methods of Learning A variety of techniques will be used to enhance your learning for this course. These include lecture, discussion, debates, exams, video cases, in-class group activities, out-of-class individual assignments, and Internet research. You are expected to come to every session having completed your reading and/or other assignments. Bring your book to class every time. You will be using it. Course Evaluation You will have several opportunities to demonstrate your knowledge and understanding of the principles taught in this course. Though much of the learning is actually achieved in-class, you are expected to complete certain assignments before class and to turn in outside assignments on time. The grading scale for course grades will be 90% and above: A, 80% to 90%: B, 70% to 80%: C, 60% to 70%: D, and less than 60%: F.
Four absences or lack of satisfactory completion of assignments may result in your being dropped from the class or receiving an unsatisfactory grade. Every absence after the allotted four will result in the loss of 5 points per absence taken from final score. All of the components of the class must be completed within the semester and the final exam taken at the scheduled time. No incompletes will be given. If you determine that you are unable to attend class and complete the in-class work as well as the assignments, then it is your responsibility to drop the class. All homework must be typed and submitted prior to class starting. There will be no make-up exams given.